This wonderful property, which is located in “Wine Country” also has the Pedernales River and acreage to enjoy. Two suites available are found under the long porch. While staying enjoy the quiet plus the gorgeous sunsets overlooking the large oak tree and pond on the adjoining property and as an added treat enjoy the sky of stars at night! Your hosts do live on the property found in front of these comfy suites. The small suite has an iron double bed with a heavy vintage duvet. 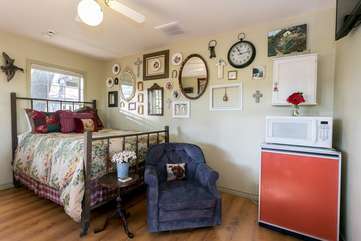 There is a small refrigerator, microwave and a small coffeemaker. A comfy chair is perfect for reading or just relaxing, or watching the 32” flat screen TV. A tub/shower and antique vanity are found in the bathroom. On the porch you’ll find a double rocker. Lone Star Guest Haus is found directly behind the homeowners house and offers a private drive (look for the big yellow flower) and walkway. Across the road is also owned by the homeowners and leads guests to the Pedernales River. PETS - Limit 3 under 60 lbs.